Lara RSL Sub Branch. We are members of the Returned and Services League Australia. For further Information about RSL Victoria, see www.rslvic.com.au. The building we use was formerly the Corio Roads Board, then Corio Shire office until 1937. The centre section was built in 1863, and the wings added in 1923. It is a heritage listed building and is one of the oldest remaining buildings in Lara. By appointment; call Bruce on 0400546449 or see a member at the Sub Branch Friday nights 6 - 8 pm. 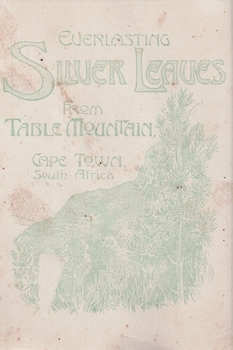 Rectangular piece of cardboard with a stereograph image attached to the front. The image is a double reproduction of a black and white photograph. 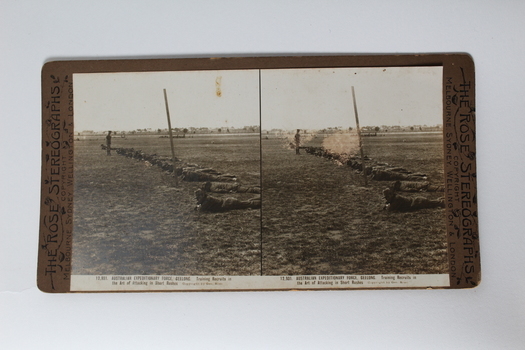 the photograph depicts a line of soldiers lying on the ground. George Rose was well known Australian photographer and postcard maker in the first half of the 20th century. This sterograph shows recruits training at Geelong during the First World War. Soldiers were trained to attack in short rushes rather than advancing in line due to the lethal power of the machine gun. The stereograph was an early technology that used double images to achieve a three dimensional image. AUSTRALIAN EXPERDITIONARY FORCE, GEELONG. Training Recruits in the Art of Attacking in Short Rushes. Copyright by Geo. Rose. 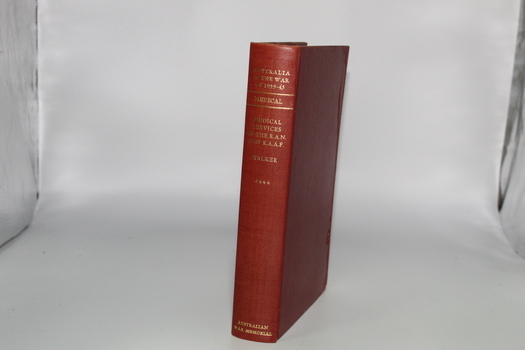 Part One - Medical services of the RAN Part 2 - Medical Services of the RAAF. Part 3 - Women in the Army Medical Services. Australia in the War of 1939-45 ARMY The Final Campaigns LONG Australian War Memorial. 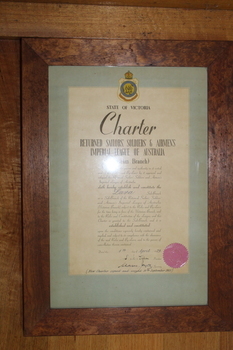 Note on bottom of Charter "New Charter signed and issued 15th September 1953." Sailors cap cloth Band, known as a Tally Band, a collection of: - H.M.A.S., H.M.A.S. Sydney, H.M.A.S. 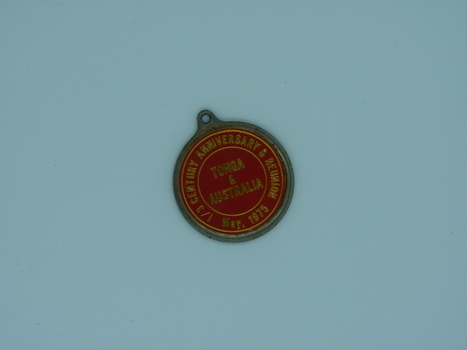 Tobruk, H.M.A.S. Canderra, H.M.A.S. Vampire, H.M.A.S. 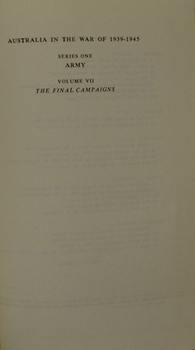 Leeuwin, H.M.A.S. Cerberbus, mounted in a wooden and glass display frame. Cloth Tally bands, mounted in a wooden and glass display frame. The medallion is metal with enamel coloured detail and gold text. Ronald Leslie Gregory (R/22961) served in the Australian Royal Navy. Born 5th August 1921, he enlisted on the 7th March 1939, and served on the HMAS Kuttabul II. He was discharged in 1948. 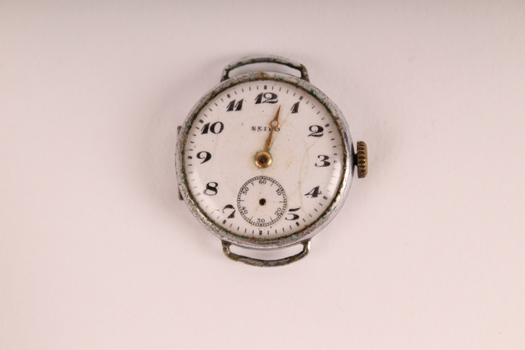 The medallion forms part of a collection of Ronald Leslie's belongings that were donated to the Lara RSL in 2006. 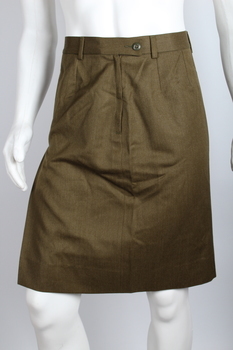 Khaki skirt from a Maori Service Uniform. Two small round medals with eyelet on top. 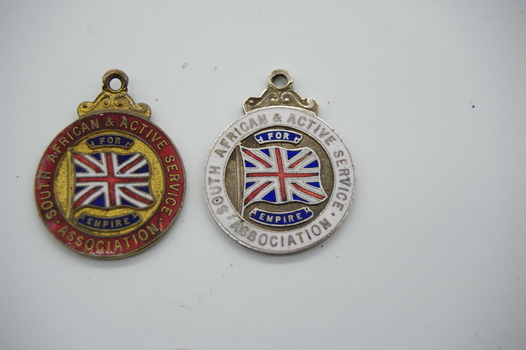 Both medals are the same on the front except the Brass one has a red band around the diameter with the words South African & Active Service Association on it,The Silver one has a white band on it..Within the band is the Union Jack with the word FOR above it and EMPIRE below it.The obverse has a circle in the middle with a female with a flowing cape within it.It has the numbers 216 above the female and 1929 below her on the brass medal and the numbers 232 above the female and 1930-1 below her. 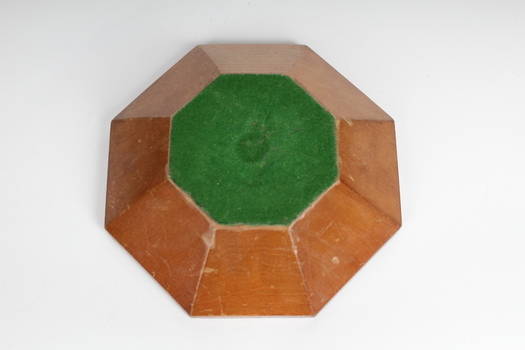 Small octagonal wooden sound block with sloped sides and green felt top. Underside is painted dark green and has a round hole in the base. 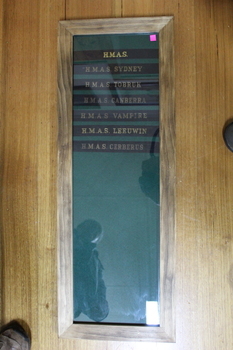 This sound block was presented along with a gavel to the Lara RSL by AJ Quick in 1965. Alan James Quick was a member of the 1st Australian Parachute Battalion during the Second World War, and was later a life member of Lara RSL. Alan received the RSL Meritorious Service Medal. Alan was the president of Lara RSL from 1965-1970, and this gavel was used at committee meetings by the president after its donation in 1965. 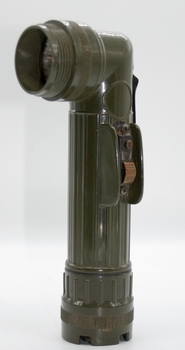 This sound blockis a key object of Lara RSL's history. It was used in committee meetings in the 1960s and perhaps later, and provides a documented link to an earlier president. 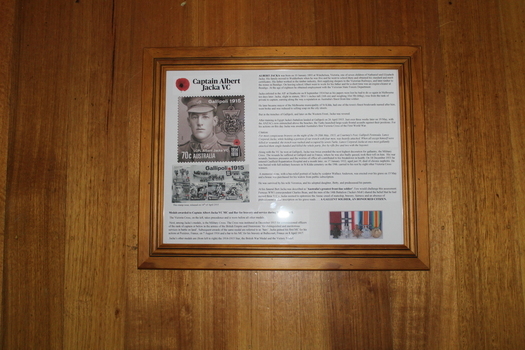 Captain Albert Jacka VC Biography. Glass covered picture frame showing Albert Jacka with a short run down on his life. Tells the story of one Australias finest soldiers and what they had to endure during the war. Picture of Albert Jacka with his medals and biography of his life. Brown thin cardboard Tag, Small metal eye-let. 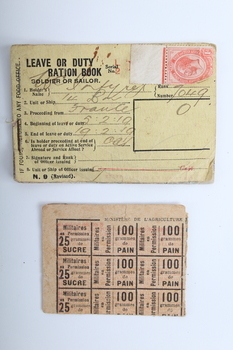 Tag has a peferation across the middle of the tag.WW1 issue. To be attached to the top button tunic. Assigned to S.W. Ellis. Reverse of the tag : A.I.F. Unit : 2 MGC Name : Ellis S.W., Rank : Pte. Number : 640, Hospital : , Diagnosis : Effort Sysdrome. 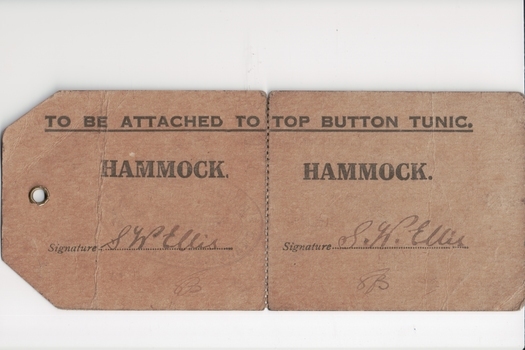 Information is duplicated on both sides of the perforation of the tag. Postcard Book .Rectangular in shape.Red in colour with a ribbon tied through two 4mm pierce holes in the spine. 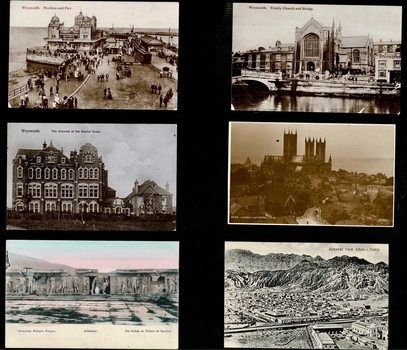 These Postcard booklets were readily available in Cairo souvenir shops for service personal to send back home to their loved ones. 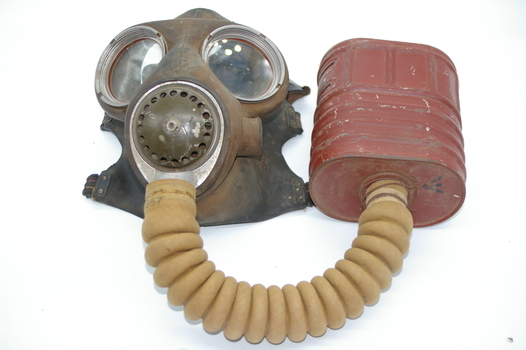 Used in WW1 by service personal in Egypt. 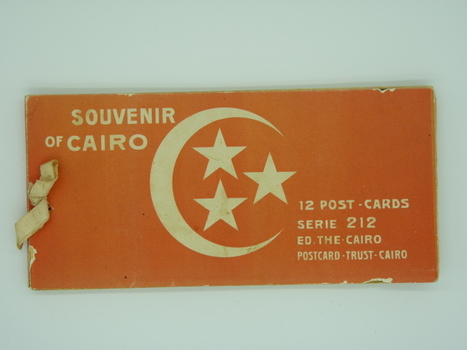 SOUVENIR OF CAIRO. 12 Post-cards. Serie212. ED.THE-CAIRO. Postcard-Trust-Cairo. also has a crescent moon with three five point stars within it.